Waterfall Rappelling with Jaco Canyoning » Lavi was here. 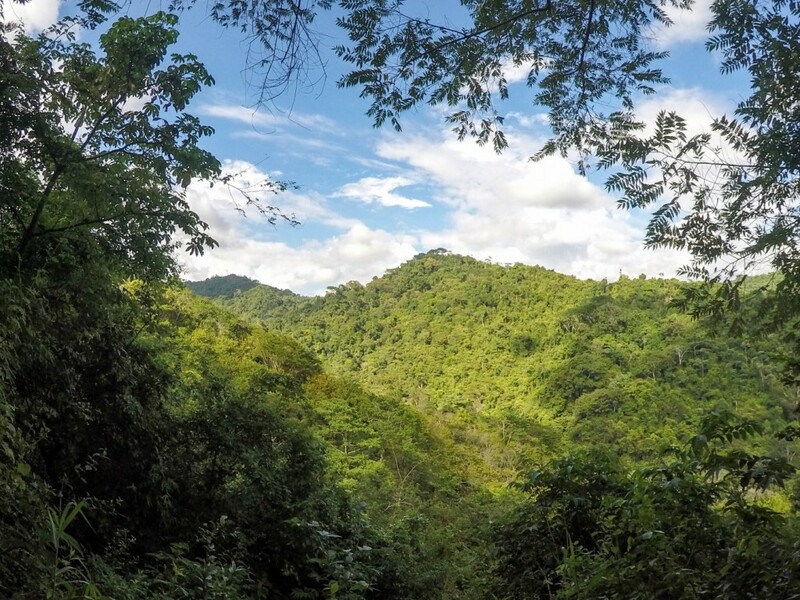 When in Costa Rica, it’s pretty much a sure thing that the trip will involve heart-thumping, adrenaline-pumping activities. Still, I didn’t exactly expect to be scaling down waterfalls in Jacó, Costa Rica, with an amazing couple on their honeymoon and two awesome guides. I joined Jaco Canyoning on a waterfall rappelling and zip line adventure that was definitely something I’ll be telling the grandkids about one day. I’d just arrived in Jacó and thrown my backpack into my locker when Cristian and Joshua, my guides for the day, picked me up for the waterfall rappelling excursion. I jumped in the van and quickly introduced myself to the other two people on my tour: a newlywed couple. Luckily, they were more than happy to have me along for one of the many adrenaline fueled tours they’d been on while on their honeymoon in Costa Rica. I couldn’t have asked for a better couple to do this with! After a quick drive, we arrived at the property for the tour. The area was quiet, surrounded by hills and trees, and completely serene. Cristian and Joshua fitted us with harnesses, helmets, and gloves before we started our ascent to the first zip line. They took their time with explaining the procedures and taught us how to both rappel and zip line safely. With rappelling, the key was to sit back, keep your legs straight, and slowly step down. If you didn’t sit back, you’d probably hit your body against the waterfall. Hard. 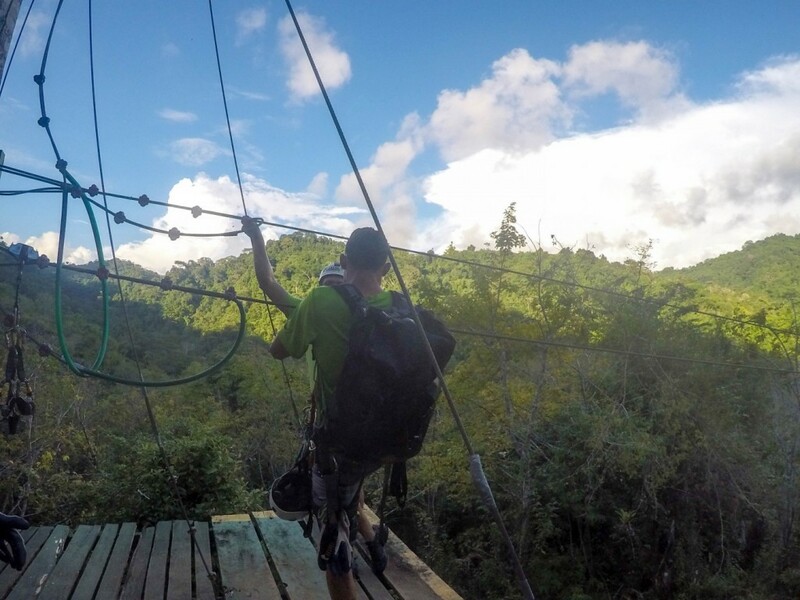 With zip lining, all you really had to do was run and let momentum guide you to the other side and not freak out while being suspended over the jungle. Our first zip line brought us to the first waterfall. I was nervous, but somehow ended up being the first person to rappel. 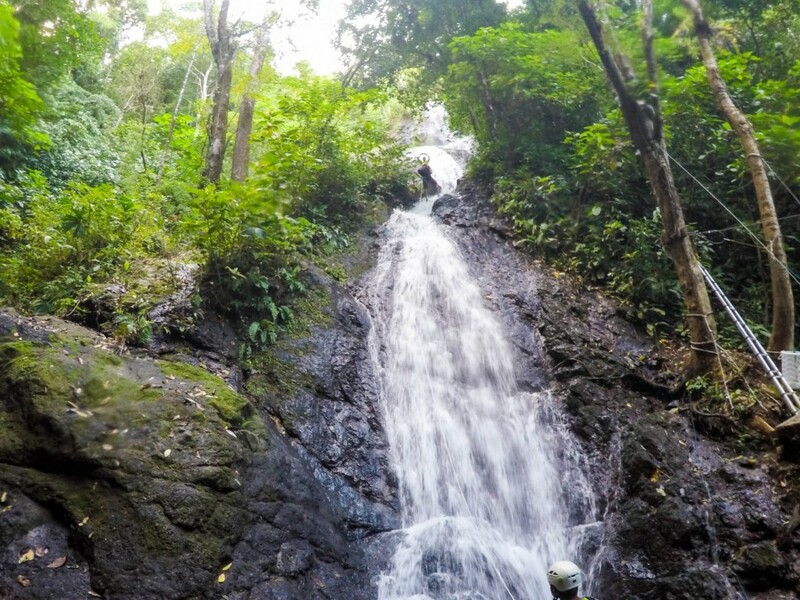 My mind became a jumble and for a moment I forgot everything Cristian and Joshua told me as I hit my knees on the wooden platform, but they were quick to remind me to relax and allow gravity to lower me down from the platform to the waterfall. Then I sat back, tried to keep my legs as straight as possible, and made my way down the waterfall. I listened intently for Joshua, who was managing the ropes below me, to let me know when I should move to the left or right to rappel safely down the waterfall. 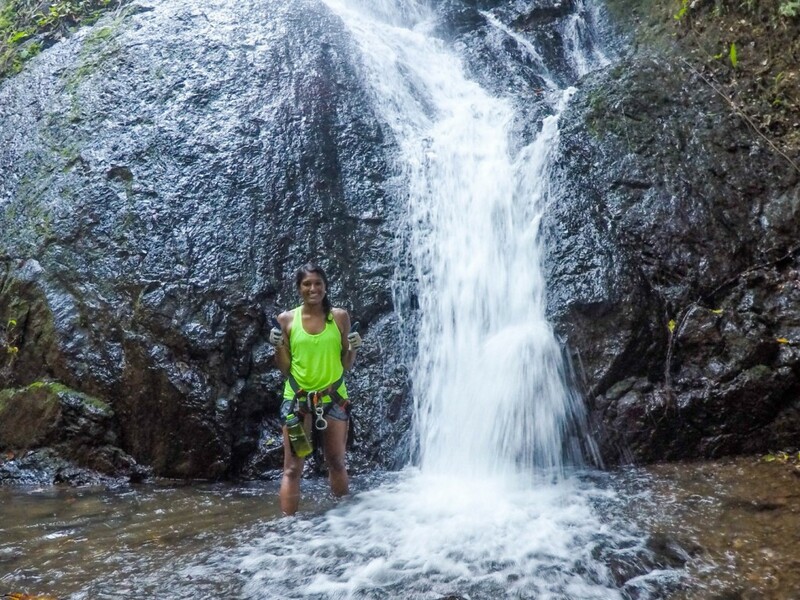 It was a rush; the water was cold and refreshing and all I could feel was elation as I was suspended in the air, rappelling down a waterfall all by myself. 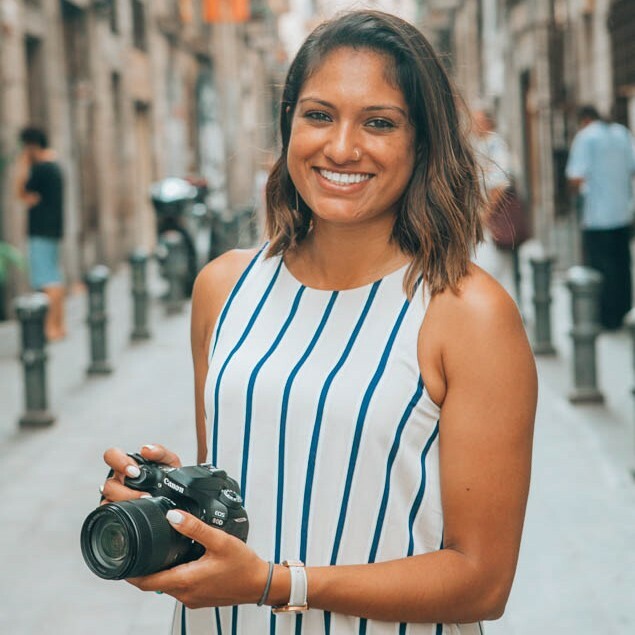 It was something I’d always wanted to do while in Central America, I just couldn’t believe I was doing it! The honeymooners and I took turns being the first to descend down the waterfalls. As we became more comfortable with the waterfalls, it was so fun! Actually, it was always fun. The zip lines were also such a rush. 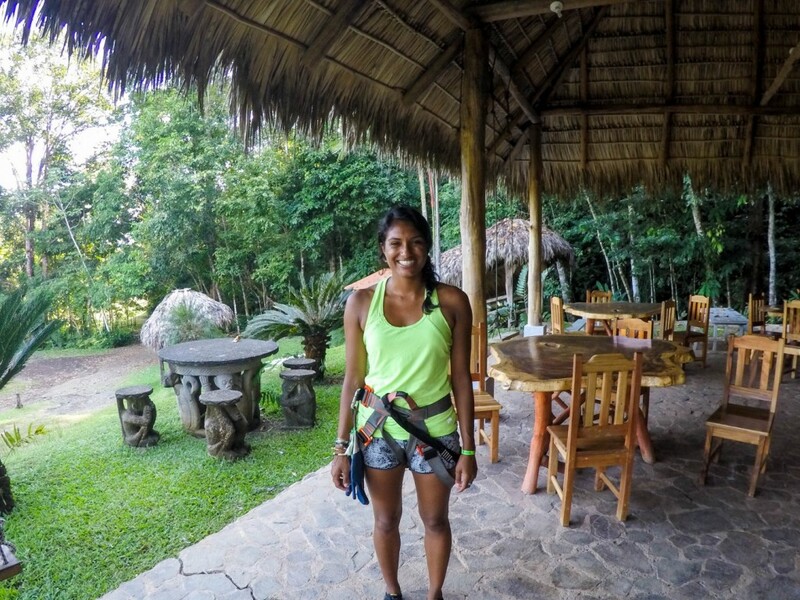 After zip lining in Monteverde, I was well versed in how to not freak out while zip lining, though I did find myself cursing under my breath as I contemplated what would happen if I got stuck up there. Don’t worry, I didn’t. The biggest adrenaline rush by far was the “monkey swing”: you get pulled out so that you’re hanging by your harness, and dropped abruptly before the ropes catch you and bring you back down to the ground. Somehow I ended up first to do this, so I wasn’t exactly sure what was going to happen since I couldn’t visualize it. Cristian pulled me out to the open air. I looked over at the couple and said, “This isn’t actually bad!”. I didn’t realize that I hadn’t experienced the scary part yet. Cristian told me to extend my arms out into the air. I did so, and abruptly my heart and body dropped, but the harness and rope caught me before I hit the ground. It was actually so much fun and definitely got my blood pumping. Once we all were safely on the ground, we hiked along the river and finished out our tour on another zip line. The entire experience was truly one of my favorites in Costa Rica. Cristian and Joshua allayed my fears and made sure we were all safe and having a good time. I couldn’t have asked for a better experience for my first time rappelling! I would absolutely do this again or go on another tour with Jaco Canyoning. 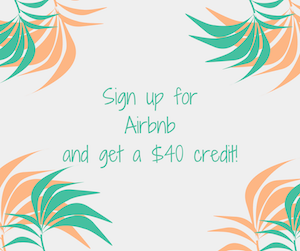 It’s way too fun and exciting to miss while in Costa Rica! 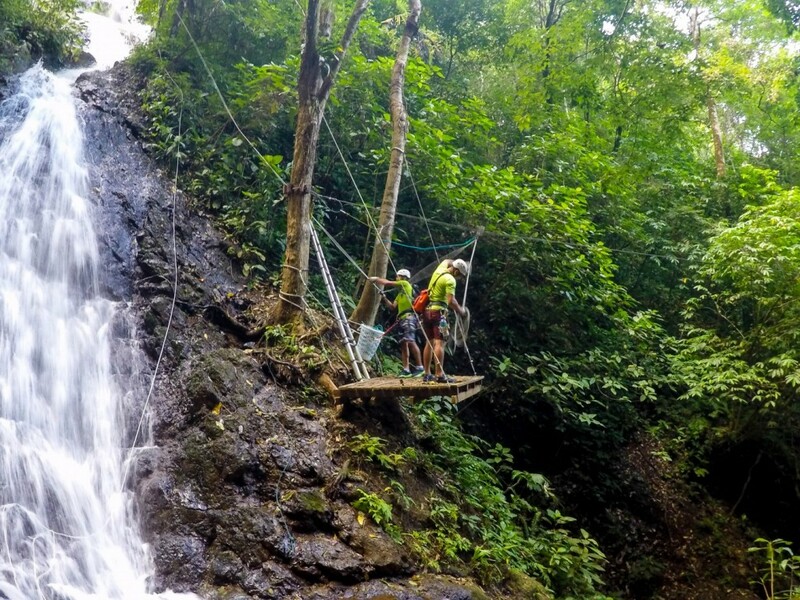 Cost: $99 for the waterfall rappelling tour. 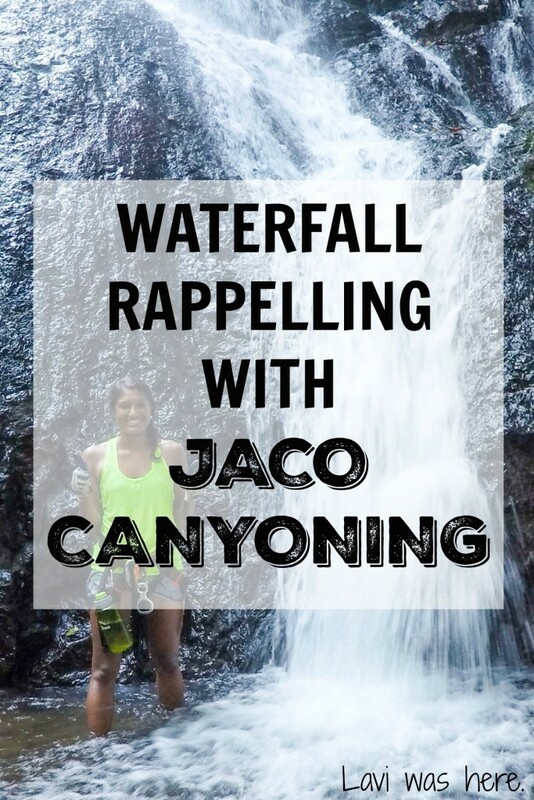 Other Tours: If waterfall rappelling isn’t your thing, Jaco Canyoning offers a variety of tours ranging from cliff jumping to stand-up paddle boarding – check out their website and take your pick! What to Bring: You’re going to get completely soaked, so be sure to wear clothes that you don’t mind getting wet. I wore an athletic tank top and running shorts, but it also wouldn’t hurt to wear a swimsuit underneath your clothes. Your shoes will also get completely soaked. Luckily, I my incredibly kind blogger friend Steph let me borrow her Vibram waterproof shoes that were so awesome that I’m going to buy a pair for myself as soon as I get home. Many thanks to Jaco Canyoning for hosting me. But don’t worry; no matter who foots the bill, I’ll always keep it real and provide my honest opinion of my experiences. 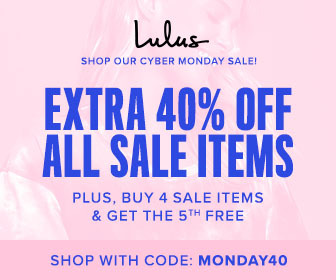 This post also contains affiliate links, which means I’ll receive a small commission for purchases made through these links at no additional cost to you. I’ll always keep it real and only promote products I absolutely love! The monkey swing was definitely a surprise but it only lasted a few seconds. It was such a rush! 🙂 Thanks for reading!